Use this search to quickly find what you're looking for. Two things to consider with swamp cooler sizing. One is the power -- the cooling capacity, which is the first thing we discuss here. The other is the size of the actual unit. Most of a swamp cooler's ability to cool is based on the amount of air flow it can produce. For this reason they are sized by air flow. Look at the cooler's CFM (Cubic Feet per Minute) or CMM (Cubic Meters per Minute) rating. This number measures the amount of air a swamp cooler can move per minute. Now consider the size of the area you'll want to cool. In the simplest terms, you'll want about half the air flow for the area you're cooling. This is a great estimate for enclosed spaces, such as garages, warehouses, outoor sheds, etc. It's even pretty good for an area enclosed by 3 or 4 sides like a patio or tent. But the less enclosed an area, the more air flow you'll want from your swamp cooler. These more open areas are hard to estimate, but you can use the basic formula as a starting point. The more open the area, the more additional air flow you'll need. Use half the air flow for the area you want to cool as a starting point. For example, if you're holding an outdoor event in a tent that's 10' x10' x10' (1,000 cubic feet), you'll need a cooler with at least 500 CFM (1,000 cubic feet divided by 2 = 500). If you're holding an event in a tent that's 3m x 3m x 3m (27 cubic meters) you'll need a cooler with at least 13.5 CMM (27 cubic meters divided by 2 = 13.5). A unit with more air flow won't increase the evaporative cooling effect, but it will increase the amount of breeze you'll feel. 1 cubic foot × 35.315 = 1 cubic meter; 1 cubic meter × .0283 = 1 cubic foot. This is less air flow than the amount needed by an outdoor fan to cool the same sized area. That's because swamp coolers have the additional cooling power of evaporation. The most important measurement in swamp cooler sizing is its CFM / CMM. But a few manufacturers also measure their coolers' BTU ratings, which can be helpful as a general guideline. BTUs (British Thermal Units) measure the evaporative part of the cooling capacity. BTUs are the most important measurement of an air conditioner's cooling capacity, but not of a swamp cooler. Since a swamp cooler's ability to cool is based on the level of humidity in the air (less humidity = more cooling), swamp coolers with more BTUs won't necessarily provide more cooling. They will have the POTENTIAL for more cooling, though. That potential will be more available on hot, dry days than on more humid days. On a hot, dry day a swamp cooler with more BTUs can provide more cooling from evaporation than a swamp cooler with fewer BTUs that has that same amount of air flow. BTU ratings are not as precise for swamp cooler sizing as they are for air conditioners. Swamp coolers need lots of fresh air in the area they are cooling to help balance humidity levels. This is different from an air conditioner that needs an enclosed area to more precisely control the cooling level. Its simpler to estimate the number of BTUs needed to cool an enclosed area that is unaffected by humidity levels than a partially enclosed area whose cooling is based on humidity levels. What to do? Once you find a swamp cooler with the right amount of air flow, see if it has about enough BTUs for the size of area you want cooled. Don't follow exact numbers on this. Use it as an estimate, only. Following exact numbers and expecting an exact amount of cooling will only give you a headache, especially if you're trying to cool a more open area. Here is a chart showing how many BTUs are suggested to cool certain sized areas with an air conditioner. It will give you a general starting point with swamp cooler sizing. These numbers will vary by manufacturer and the actual conditions of your area. *Manufacturers often use a kind of shorthand to refer to the sizes of their units. Any unit with a cooling capacity that is a multiple of 12,000 BTUs is said to provide so many "tons" of cooling. A 12,000 BTU unit is called a "1-ton" unit. A 24,000 BTU unit is called a "2-ton" unit, 36,000 BTUs is called a "3-ton" unit and so on. These are marked in the chart with an asterisk. When you purchase or rent a portable swamp cooler, consider the conditions of the area you’ll be cooling, including the weather and size of area. 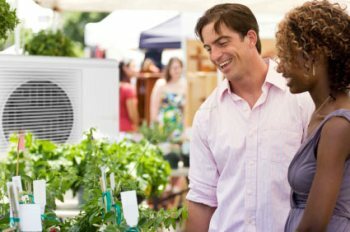 If you use a sales or rental consultant, this information will help them advise you on swamp cooler sizing and type of unit for your needs. Smaller sizes, best used for "spot cooling" or "small area cooling" use fan blades smaller than 16 inches / 40 cm but 12 inches / 30 cm is most common. These small units seldom list their blade size in the product description. They usually look like a tall rectangle under 3 feet / 1 meter tall and less than 2 feet / 61 cm wide and deep. Their cabinets are sleeker than larger sized units. You might prefer to have these in a small area with you since they are more visually appealing than the larger units. Since they are small their water tanks are rarely more than 5 gallons / 19 litres. They range from as little as 250 CFM all the way up to 3,800 CFM. Larger portable swamp coolers have fan blades that start at 16 inches / 40 cm and go up to 48 inches / 122 cm and more. They look like big screen TVs or huge computer monitors with a big fan in the back. They need large cabinets to house these large fans and water tanks of 10 to 65 gallons / 30 to 250 litres. Their cabinets may be as small as 24 inches / 60 cm square by 42 inches / 105 cm, but are usually over 3 feet / 1 metre square and deep, and can get much larger. Weights start at just under 100 lbs / 45 kg and can range up to several hundred pounds / kilograms. They are powerful, moving thousands of cubic feet per minute and capable of cooling large areas. Yet they use very little electricity -- they rarely draw more than 10 amps at 115 volts (1150 watts). So even most of these large coolers can run on regular household currents. Swamp coolers need fresh air to provide the most cooling. Because they add moisture to the cooled air, if this same air goes through the system again it will pick up even more moisture. If this keeps up, the air will pick up so much moisture it will no longer be able to provide any cooling. At that point you'd be experiencing a muggy, "swampy" mess. The simple solution is to provide fresh air -- at least a 2 square foot opening for every 100 square feet / .186 square meters for every 9.3 square meters you want to cool. This makes portable coolers well suited to partly enclosed outdoor areas. A tent, cabana or patio with an open side or a shed, trailer or booth with open windows can contain the cooled air and still have plenty of fresh air for the cooling system. To learn more about other outdoor cooling solutions that use evaporation, see our page on evaporative coolers. Visit our other pages on swamp coolers. Copyright © 2008 - 2014 AllOutCool, alloutcool.com. All rights reserved.